This is a Mass Effect Andromeda weapons page on the Hesh Shotgun. 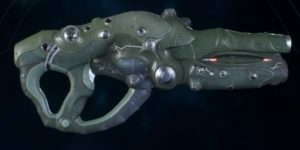 Here you’ll find information about the weapons used in Mass Effect Andromeda. The semi-automatic Hesh, translated to “order,” is a kett weapon that fires clusters of plasma-surrounded projectiles. Fired rounds are powerful enough to stagger most foes and demand submission from the rest.